My family takes college football very seriously, and when it comes to game day, few things take precedence. While Kenny has been an Ohio State Buckeye fan for as long as he can remember (I know, I know… he didn’t go there. Don’t get me started), I didn’t really become interested until my college years. The only problem was that while I attended college, our football team wasn’t the best. That’s not really fair to say, because Northwestern always boasts that our football players have the highest SAT scores of any other university, and that we take the term scholar athlete very seriously. So I suppose we are the best at some things. But you know your football team may be struggling if your bragging rights come from their SAT scores. Nonetheless, my college friends and I enjoyed bundling up, and cheering on our mighty Wildcats, whether they won or lost, but the highlight quickly became brainstorming witty cheers to shout at the opponents. For example, if we played the Hoosiers from Indiana University, and it was a rare occasion when NU was in the lead, we’d get the student section cheering, “Hoosier daddy! ?” Or when Drew Brees, quarterback for Purdue, graced our field, we’d chant, “Brees blows!” Yes, I know what you’re thinking. Puns abound when surrounded by nerdy Northwestern football fans. But my all-time favorite cheer is one that my dear husband would rather I keep to myself. It was a cool Fall day, and my freshman dorm friends and I piled into a cramped car, so that we could watch our Northwestern Wildcats likely be dominated by the Ohio State Buckeyes. We had driven a long way, but we were excited to be amongst the small group of away-game fans. As we found our seats in the visitors’ section of the horseshoe stadium, it quickly became clear that this game would not be going in our favor, and we’d better focus on coming up with a witty cheer to pass the time. The Ohio fans loudly cheered “O-H” from one end of the stadium, and the other end responded with an “I-O.” These folks knew how to cheer! But while many universities have ferocious mascots, like a wildcat, a tiger, a bear, or some other sort of intimidating animal, The Ohio State’s mascot is a poisonous nut. A nut, people! Given this knowledge, the witty cheer came quite easily to me, and I soon had nearly the entire visitors’ section chanting, “At least we’re not nuts!” So what if a super intoxicated buckeye fan tried to take a swing at me, that cheer was worth it. We may have lost the game, but that cheer was a winner. This coming weekend, undefeated Ohio State plays my beloved alma mater, Northwestern University. Fortunately, our football team seems to be pretty good this year, but just in case, I know what I’ll be cheering if the scoreboard doesn’t sway in our favor. And in honor of college football season, today’s recipe is inspired by one of the many fantastic dishes made by my Tia Pipa (Aunt Felipa). Put a bowl of this chunky salsa, filled with creamy pieces of cool avocado, in front of your football fans, and I promise their mouths will be too full to spit out any witty cheers. 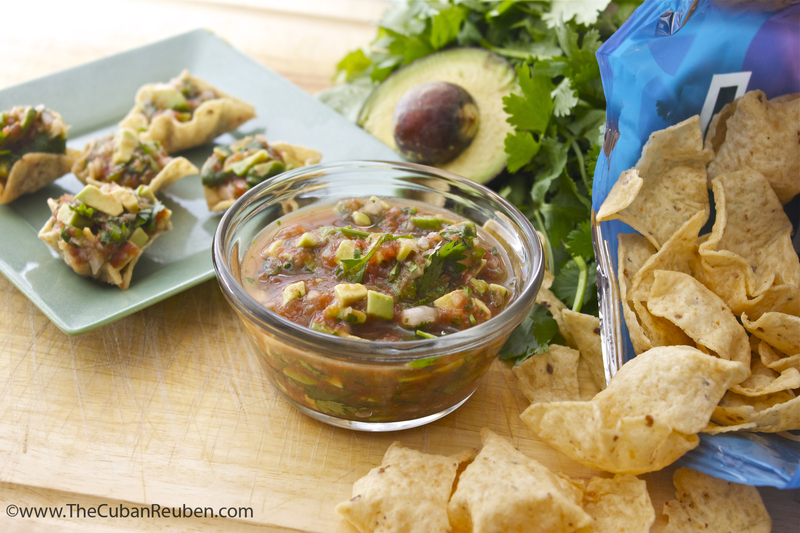 Football fans will be cheering for this chunky game day salsa! In a food processor, puree the tomatoes, 1 onion, 1 whole jalapeno pepper, 1 cup of cilantro, vinegar, garlic powder, and onion powder until all are blended into a slightly chunky sauce. Pour into a large bowl. Finely dice the second onion, and add to the bowl. Remove the seeds and ribs of the second jalapeno, finely dice, and add to the bowl. Stir in the rest of the cilantro, and season with salt and pepper to taste. When you are ready to serve, dice the avocados, and stir them into the mix. Your salsa should now be both chunky and wet. Serve and enjoy! If you prefer a spicier salsa, keep the seeds and ribs in the jalapeno pepper.